No. 12, Jalan TPP 5/5, Taman Perindustrian Puchong, 47100 Puchong, Selangor, Malaysia. 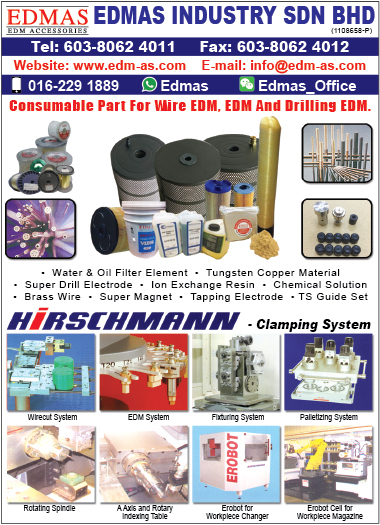 We are a company established in Malaysia and we specialized in WEDM/EDM/ Superdrill's machine consumable parts especially Wire Guide, Power Feeder, Water Nozzle & etc for all maker. We also supply of Brass Wire, Filter Element, Chemical Solution, Resin, EDM Oil, Copper / Copper Tungsten Material, Copper & Brass Pipe Electrode, Drill Chuck, Pipe Guide, EDM Tooling System and etc.